As captain and coach of the England team, Mary French would not be deterred from her convictions over how netball should be played. She felt her experience in the game was more relevant than the viewpoints of committee members with whom she clashed over uniforms, sponsorship and, in particular, competing against South Africa — the indomitable French believed in continuing to play them during the apartheid era, in contrast with the prevailing mood in the late 1960s and 1970s. She captained the team on its first tour to South Africa in 1956 — her sister lived in the country – and she felt strongly that, in order to foster the development of netball among the non-white communities, tours and fixtures should be held. She coached Cape coloureds, as they were known, and took a team of English players to compete against them on an unofficial tour, which resulted only in opprobrium. Committee members were concerned that the game should receive government funding at a time when the controversy over Basil D’Oliveira in cricket had caused a diplomatic row between Britain and South Africa. Netball England, which was founded the day before French was born in 1926, sided with the Labour government. Colleagues believe this was the reason why French was never recognised in honours lists. “Sometimes she upset the hierarchy”, Joyce Wheeler, an England colleague, said. Nor would she confirm in other respects – over uniforms or restrictions over curfews when she was coach on a tour to Australia in 1967. Even in considerable heat, the England players were required to wear hats and gloves when away from the court. French refused to wear stockings as well. When there was tut-tutting over whether the team should be allowed to visit the cinema to watch “A Man for All Seasons” French declared that they were all going and would stay out for a cup of coffee in spite of the 10pm curfew. Even so, one player was stopped by the manager who felt her performances would be hit by sitting for so long in a cinema. Highly competitive, French would not be swayed from her belief that what she was doing was for the good of netball. She would say of the Sports Council’s slogan: “It is ‘Sport for all’ – if you can afford it” She was at the forefront of advocating medicals for players and the employment if a fitness trainer. She was born Mary Patricia Bushell in 1926 and grew up in Brockley, south London. She took to netball at Mary Datchelor girls’ school, which had a fine reputation for sport. Then was evacuated to Wales during the Second World War, before attending Dartford College of Physical Education and then teaching at Purley County School. She represented Surrey and, although lacking in height could read the game well. When she moved on to teach mathematics at Croydon High School, she had time for netball. She played for England in their first international match, in 1949, and continued to do so until 1957, the year before she married Philip French, a bank inspector. While bringing up her two daughters, Jaqi and Nicky, she became England coach for three world championships – and both daughters had to contend with going to Croydon High School where their mother still taught. Later when French was coaching Wales, having helped to establish the game there in 1945, she deployed Nicky’s husband as a goalkeeper in training sessions. “My mother wanted her players to practise against him in case they came up against someone unusually tall. Aidan quite enjoyed the attention. Funds where so tight that French and Phyllis Ridgewell, her friend and fellow England international, had to sell souvenirs at the world championships at Eastbourne in 1963. In 1967 the players had to finance their hotel accommodation when they broke their return journey from Australia and New Zealand, where, for ten weeks, they had been billeted in their opponents’ homes. French made lifelong friends away from the court. She applied her mathematical mind to jigsaws and crosswords when at home and retained a keen statistical grasp of netball and other sports. “But she was not a great lover of modern netball”, Nora Ashworth, another international colleague and friend said, “She thought it too rough, resulting in too much whistle and far too many penalties, particularly penalty shots. French’s husband died in 1985. Neither Jaqi, who became head teacher of a nursery school, nor Nicky, who works for Homebase, became immersed in sport – certainly not to the extent of their mother’s insistence on umpiring matches when heavily pregnant. Instead, they had to contend with overseeing the rebuilding of her front garden wall several times after she had driven into it (her supermarket in Croydon took a few bashes as well!). She had proclaimed her intention of giving up driving on her 90th birthday, all the while protesting her innocence, but getting her own way. 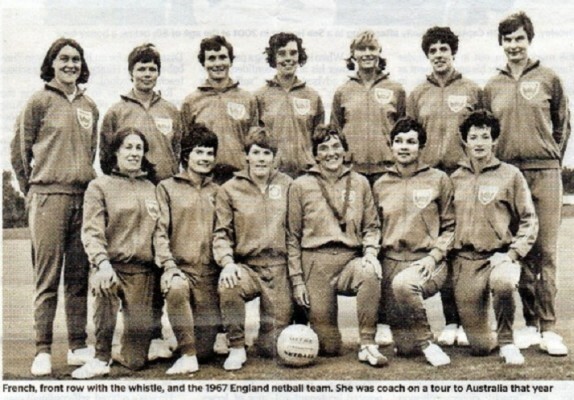 Mary French, netball player and coach, was born on February 13th 1926. She died on January 15th 2016, aged 89.